However, only a small percentage of mobile users are willing to pay for the premium experience. “People want free content more than they want to avoid ads or to have the absolute highest quality content possible,” explains report author, Mary Ellen Gordon, Director, Industry Insights and Analysis at Flurry. The company also confirmed the conventional wisdom as well as other industry reports around the subject of app pricing on Android – specifically, that users on that platform are even less willing to pay for mobile apps than those on iOS. 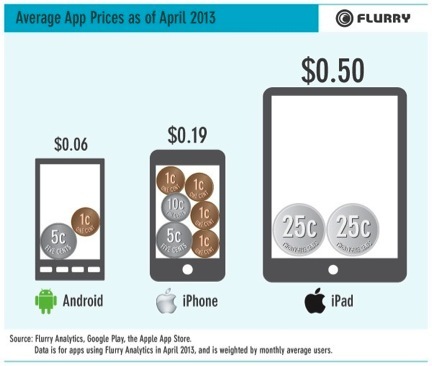 In April 2013, the average price of Android apps (factoring in free and paid) was $0.06, while on iPhone it was $0.19 and on iPad it came to $0.50. Flurry estimated that iPad users’ willingness to pay could be due to their higher incomes, but that’s not the complete story. When the iPad was first introduced, the general trend was that app developers would charge more for the big-screen version. Maybe initially that was due to the potentially higher incomes of the iPad’s early adopters, or it could have been because an iPad app took extra development time which needed to be accounted for. Whatever the reason, these same pricing strategies have stuck around even as the iPad moved into the lead position in the tablet market, and broadened its reach to include more mainstream users. As for what pushed developers across both platforms – iOS and Android – to make their apps free? 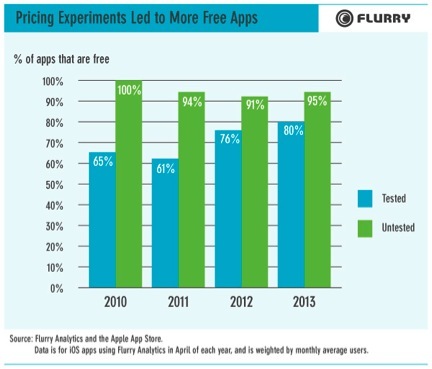 Flurry chalks this up to a history of A/B testing and pricing experiments within the developer community. Among those developers who carefully tested users’ willingness to pay at various price points, there was a notable move to free apps in recent months. The conclusion here is that these developers must have found that even a $0.99 price for an app significantly impacted demand. The app universe, then, is starting to look more like TV, radio and online, the report concludes. That is, people may not like ads, but they’re willing to tolerate them in exchange for free content. What’s more, apps have a potential path to revenue not available on those traditional platforms: the in-app purchase. This can be incredibly lucrative for publishers who achieve a top title. For example, this summer’s runaway hit Candy Crush Saga is pulling in $633,000 per day, according to some reports. Still, the ability for a new publisher to get an app in the upper echelons of the app stores is also becoming more difficult, other reports have found. Data released by Distimo earlier this year stated that only 2 percent of iPhone top publishers were newcomers, and only 3 percent on Google Play were. That could prove a challenge for the business of app making in the long run. Before users can convert to paid users via the in-app purchase, they first have to find the app and download it. And this is now proving tougher than ever.